Payment-focused ISVs and VARs are essential participants in the U.S. payments ecosystem. Boston, February 2, 2017 – The U.S. payments ecosystem is possibly the most complex on the globe, with thousands of companies supporting the process at every entry point in the payment value chain. Payment-focused independent software vendors (ISVs) and value-added resellers (VARs) support midsize and larger merchants and also support the ISVs and VARs that don’t have payment expertise in-house. How do ISVs and VSRs work to ensure that the EMV standard is broadly implemented in the U.S. merchant community? How can payment networks and acquirers help them to better support their clients to accelerate EMV implementation? 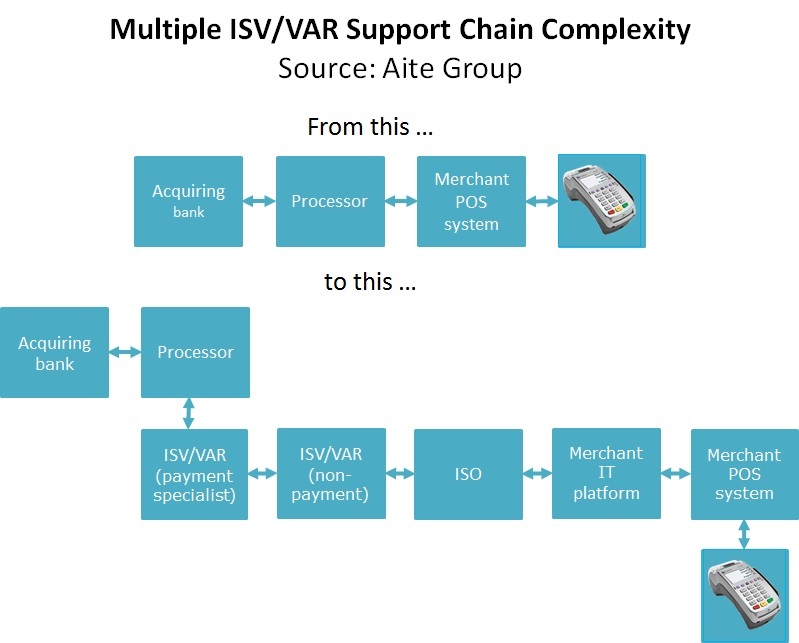 This Impact Note defines the context of the ecosystem for payment-focused ISVs/VARs, describes their function and value to their merchant and ISV/VAR clients, identifies the different types of ISVs/VARs in the space and their roles, and suggests areas in which payment networks and acquirers could help ISVs/VARs better support their clients to accelerate EMV implementation. It is based on extensive research of over 200 payment-focused ISVs/VARs doing business in the U.S., along with interviews and conversations with payment-focused ISVs/VARs. This 19-page Impact Note contains four figures and five tables. Clients of Aite Group’s Retail Banking & Payments service can download this report, the corresponding charts, and the Executive Impact Deck. This report mentions American Express, Authorize.Net, Bank of America Merchant Services, Beanstream, Bluefin, BlueSnap, Braintree (PayPal), BridgePay, Cayan, Chase Merchant Services, Clearent, CPN, Clover, Discover, Elavon, ExaDigm, First Data Merchant Services, Future POS, Ingenico, Mastercard, Micros (Oracle), Pax, Payscout, Pivotal Payments, Revel Systems, Roam Data (Ingenico), Shift4, Square, Squirrel Systems, Stripe, Toshiba, TrustCommerce, Verifone, and Visa.